It might be time to upgrade my Ramirez DePietro deck. Yarr. That’s awesome! Is that a goat on his right? piratas tribal commander on the way! Very cool with Kari Zev. I don’t know how to say this, Nekusar… PIRATES!! Isn’t that absolutely crazy? A repeated mind control that doesn’t end when this dies. So, you have to damage the permanent with combat damage. Which means you probably will lose that pirate or the creature damaged will die. You also will need to someone make the creature block which is hard (not impossible) without green. Seems like a meh card. The only real use is to steal planeswalkers and to build a deck on the hope your opponent is running them? Bad idea. Fair enough. I misread it. That makes it better, marginally. EDH pirate tribal here I come. I can finally expand beyond pretending with Thada Adel. But you can already do it! It isn’t very good… but… hey… there’s plenty of flavorful cards available. There are legendary pirates, but none of them have actual tribal support, you can build a pirate theme deck, but not really a cohesive mechanical pirate tribal. I love the card, but hate the use of the name ‘Beckett’; so damn cliche. Also way to go to drop masterpieces at the set involving Dinosaurs and Pirates, it would seem like there’s be a ton of treasure and monstrous secrets. Flavor fail. I just want Captain Blubber. The more I look at this guy the more i don’t like him. They could have at least given him some evasion or something. If I can’t get him through my enemy’s defenses, he does nothing, and if my enemy has no creatures there isn’t a lot I can steal. What if I don’t want to play with other Pirates? Then why would you play this card? Because I want a Grixis Commander that steals stuff. Okay yeah. This card is garbage for my purposes then. Even in Pirate Tribal EDH it’ll be hard to use this guy well if you have to hit with three of them. Marchesa, the Black Rose doesn’t steal stuff, but you can use theft cards to steal creatures, put +1/+1 counters on them, and then kill them. When they come back, they’re yours until they leave the battlefield. You don’t need to get him through your enemy’s defenses. You need to get a Pirate through your enemy’s defenses. Planeswalkers… Enchantments… Artifacts… still sounds like a lot to me. If I don’t have a lot of (or any) pirates that’s the same thing. I shouldn’t have to be dependent on having a bunch of other cards for my commander to do something, especially with all the board wiping and pinpoint removal. And it’s not one pirate. It’s three or more. So… you are saying that Kaalia of the Vast is a bad Commander? You state categorically about a hypotetical blurred card. Kaalia isn’t dependent on them, she enables them. She makes it easier to play the Angels, Dragons, and Demons. She doesn’t have an effect that says something like “if you have an Angel, Dragon, or Demon in play do blank” there’s a difference between having a commander that wants me to have a bunch of pirates in my deck and a commander that needs me to have a bunch of pirates in play. And I might state it categorically, but that’s based on images of a far less blurry card in which it looks like it says three. Unblockable would be fun. Let’s get thiefy. I am so pumped for a Pirate and Dinosaur Tribal set, especially one that’s so colorful. I like how yes, tribal would be smart with the Admiral, but it’s not JUST about pirates. It’s all about theft and thievery. My god, do I love that. If this really says “one or more” this is a very impressive card. Generally only one use of the second ability is enough, and he doesn’t have to stick around or be present in combat. It already combines favorably with both Kari Zev and Skyship Plunderer. I’m pretty sure it says three or more, which makes him very unimpressive to me. If three of my creatures can hit you in the face, generally I’m winning anyway. Yeah I think so too. That’s what they had on other forums. Another site has a slightly less blurry image, and it definitely says three or more. uh grixis the color of a cold blooded murder who thoroughly enjoys his craft. These are also the colors of pirates as they are criminals(black), reckless and free living(red) and they are either water or better yet air based(blue). The three colors together suggest that this is a true pirate lord. Is this a lady or is this James May from Top Gear? Is there an eternal format card called the Modern Major General? 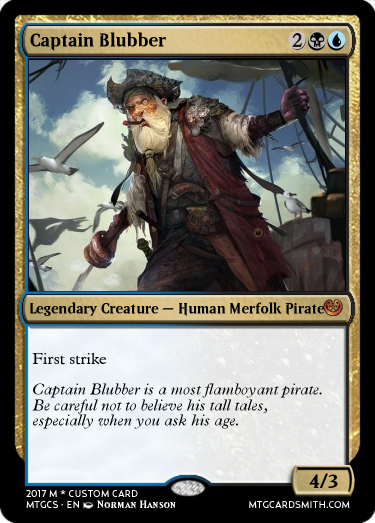 I would so dearly love to create a Pirate EDH deck, however, I feel even with the new tribal tech and new cards in this set: it just can’t compete in a finely-tuned meta. If you’re playing in a “finely-tuned meta” you’re doing EDH wrong.